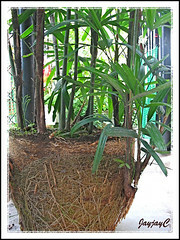 Did you notice in the right photo that the Lady Palm had broken its pot? Hence, we were forced to replant them but it took an awful long time for us to actually do so….which we finally did early last month. Unbelievable, we procrastinated for almost a year! Thus began the big job of propagating the Rhapis excelsa (commonly known too as Broadleaf Lady Palm or Bamboo Palm), by dividing the large and compact clump of plants. We did not realized that it was such a tough nut to crack! 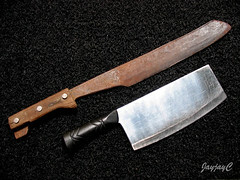 Our machete was so blunt and though the meat chopper was sharp, it seemed overworked after a while! By the time, we completed the task over 2 grumbling days, handicapped by unsharpened tools, John and I had blisters on our palms and aching backs! Looks like Lady Palm did a better job, having cracked its pot easily for the second time within 5 years! Break the existing pot with a hammer or machete and discard the broken pieces. This is easy but the subsequent steps are tough if not equipped with the right tools. A machete and meat cleaver is handy (you may know of better ones) but these tools have to be very sharp. 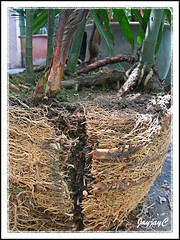 Remove about a third of the height of the rooted mass by tilting the clump to lie horizontally on the ground. Then, use a machete, meat chopper or other relevant tools to remove that one-third section. You can then plant these, 2-3 young plants in a pot filled with potting mix. Press the soil firmly around each stem. A 15-inch pot of good quality will be just fine for a start. 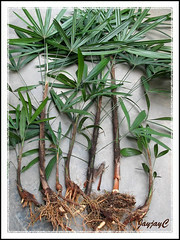 Lady Palm is not particular with soil, those sold in garden nurseries is suitable. Wet through thoroughly and site at a sunny place. With regular watering, they should flourish to become new plants. That’s it. But, if you want to replant the just shaven clump of old canes, you can. Though first, you have to downsize further the old clump widthwise so that it can fit into the new container, with sufficient space around it and be enclosed with new soil. Do this by chopping off right down a third of its width on two adjacent sides. Not to worry as these canes are tough and can withstand the stress of division. Probably some canes have to be discarded in the process. Then, replant it as you would for a tree with the crown at the previous soil level, in a good quality container filled with garden soil. As mentioned earlier, any soil type will do. 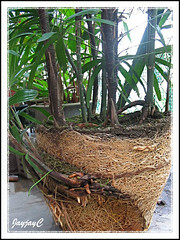 Ensure that all the exposed roots and bases of canes are firmly covered with soil. Water through thoroughly. 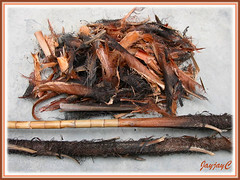 Its normal for some fronds to brown as the Lady Palm canes try to establish to the new surrounding and spread their roots. Just snip away as they appear. With proper care, they will reward you with luxuriant growth and even new shoots eventually. 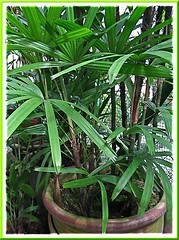 If interested to know more on Rhapis excelsa (Lady Palm), read here. Gardening tip: When replanting or thinning large clumps of Lady Palm, do not discard the unwanted stems, recycle them instead! Just peal off the fibrous material and leaf sheaths covering them with a pen-knife, to get strong and sturdy bamboo-like canes that are excellent for staking vines, climbers or other tall flowering plants that need support. I struggled/wrestled too this past weekend separating my Lady Palm. We live on the south west coast of Florida and my Lady Palm is planted in the ground – sandy soil with morning sun . I had to move a storage box as I was attempting to separate a volunteer that was on the wrong side of the fence (just couldn’t get it to budge even after I cut the horizontal roots so I gave up on that one at least for now!). I found another volunteer growing under the box! 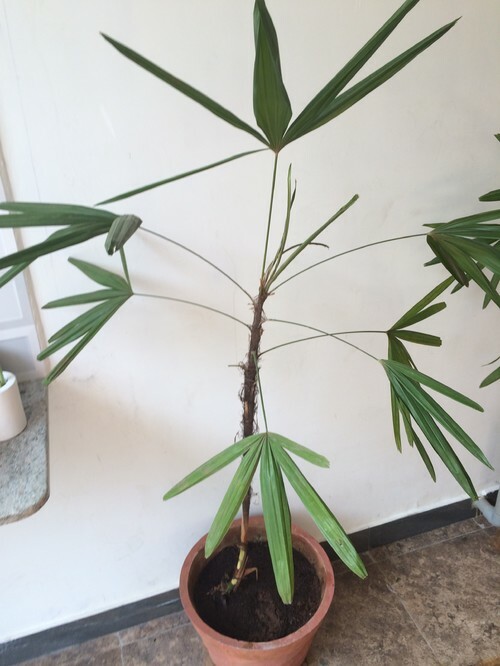 Sturdy crooked stalk with small almost yellow leaves but very much alive so I have transplanted it into a pot. We’ll see how it does. 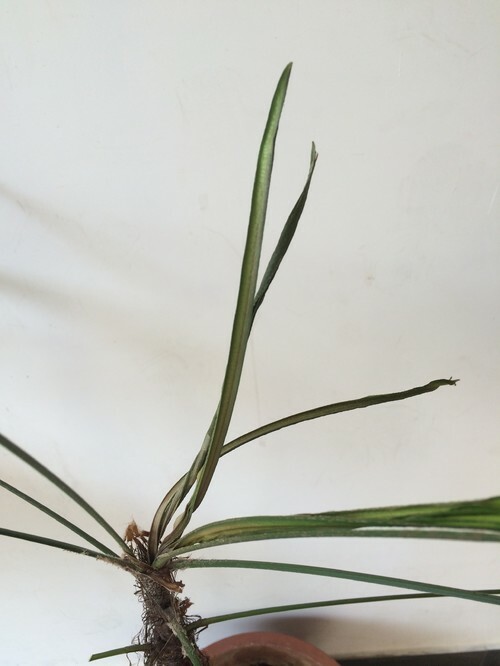 I transplanted a stalk a few weeks ago and it is growing as if nothing has happened and we had not had much rain and my watering is sporatic at best. Wish all my plants responded so well to transplanting! Love your website as it is very informative! Keep up the good work. Anyway, wish you the very best in your transplanting. And thanks for the compliment…really appreciate it! I’m curious about the root mass. You mean the whole root ball thingy is unwanted and the only thing that matters is those few root trails from the plant? just remove the shoots. So, I guess what is important is the main root and not the fine roots encircling? 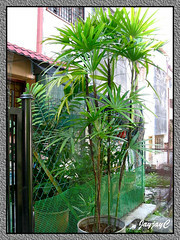 Do let me know how is the lady palm doing now. You’re right, James…it’s chop, chop and chop, but beware that each young plant must have at least its tap root with some healthy lateral (or is it fibrous?) 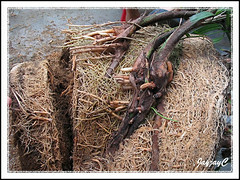 roots to continue its growth, as illustrated in the image above. So glad to have found this information. I’m about to re-pot my Lady Palm. Looks like I may need to enlist my hubby for the extra muscle even though it’s just a houseplant. The tallest canes no longer have fronds on the lower part of the stems. Is it possible for them to sprout new leaves on the bare stems. Or must I rely entirely on new shoots and younger/shorter canes to fill the void? This is the only palm I’ve ever grown, so my knowledge is very limited. Haha…you’d definitely need that extra muscle, Carolyn! This is one tough ‘Lady’, you’ll see! That’s typical of most palms, no more new fronds will emerge from where the old fronds have dropped and left leaf scars on the stems. Nonetheless, as you’ve guessed. suckers will sprout to create a multi-level look, which gives a lovely appearance, I think. Cheers and all the best in your repotting! Question: Is there a way to keep these tough lady palms, planted in the ground, from spreading? I have dug up and repotted so many already! Somewhere I heard that copper might work, along the line of a chemical reaction, but no details! I am getting ready to remove a clump that has outgrown its bed, and am thinking of adding a copper strip (like a drip or threshold strip) at the edge of the bed. Don’t mind spending the $ or time to do this, but am wondering if a building supply store available strip would be deep enough to stop the rhyzome spread? Does any one have any insights or other ideas? Hi Laurel! These palms cannot be pruned back to promote bushiness as new growth occurs at the top central growing point of the canes. Nonetheless, if your clumps are healthy and well-cared, they should be producing offshoots or new plants from the underground rhizomes which will then add fullness themselves. I think it’s normal for the emerging leaf to turn yellow as the whole palm gets itself established in its new environment. All the best. Thanks Jacqueline will update status of plant in few days.how often should I water till it gets established or any other care I should keep in mind? To know more on how to take care of your plant, please check out our post @ https://www.jaycjayc.com/rhapis-excelsa-lady-palm/. Hope all turn out fine for your plant. You’re most welcome, Palm Guy. New shoots will not grow if its trunk is pruned down as offshoots are produced only from underground rhizome. 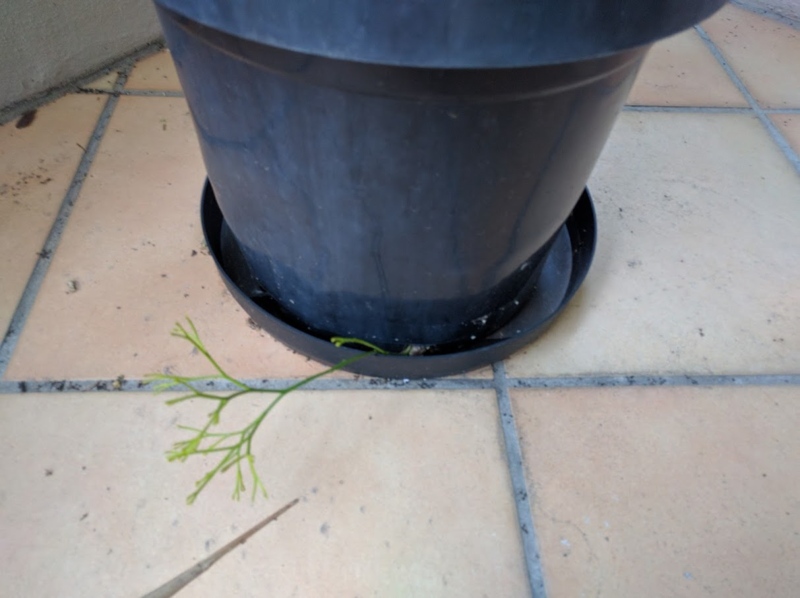 By the way, looking at one of your pictures again, I think you need to cover your plant with a little more soil… if I’m not mistaken, its crown is a little exposed. Is that outgrowth from the plant itself, or some sort of weed? It seems strange as it doesn’t look like the rest of my plant. It appears to be some kind of weed, I think. It doesn’t resemble an offshoot of the Lady Palm.